Trickbox TV supplies multi-camera production in London. 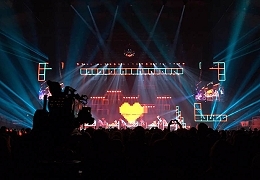 London, November 2017: Trickbox TV, a leading supplier of equipment and services for studio and location multi-camera productions for broadcast, video production, webcasting and live events, has announced that its fly-away, multi-camera solution has been used by concert films and music documentaries specialists Toward Infinity. The technology was used to record concerts for pop sensations Bananarama and Steps. The Bananarama gig, which took place on Monday 20th November at the London Eventim Apollo, and the Steps concert, which took place on Saturday 25th November at the SSE Arena, in Wembley, London, were recorded by Trickbox for Blu-ray and DVD sale, to be released through Live Here Now. Toward Infinity supplied Trickbox with camera plans. Trickbox then managed the whole installation including the production design, providing the technical equipment to record the shows as well as the crew to rig and de-rig it plus Vision Engineers and Unit Managers. London fans were excited to see the original Bananarama line-up take to the stage for the One Time Only tour, which started on 12th November in Glasgow. It’s the first time Siobhan Fahey, Sara Dallin and Keren Woodward have been on stage as a trio since The Brits in 1988. Fans of pop sensations Steps were delighted to see their idols take to the stage in London on Saturday. The group are celebrating their 20th anniversary with a huge sell-out UK arena tour.